Over the last 3 months we’ve been evaluating the type of products and services we’ve delivered most over the last 18 months, with the intent to tailor some new “off the shelf” packages for our clients. After reviewing the most frequently purchased services, we came up with 4 main website types + 2 new packages that fit our target market. I’ve recently reviewed all of our most common packages or services clients have purchased in the last 18 months and converted those services into cost effective website packages. We still offer custom quoting for any client who contains us, however these give prospects and idea in terms of their services. 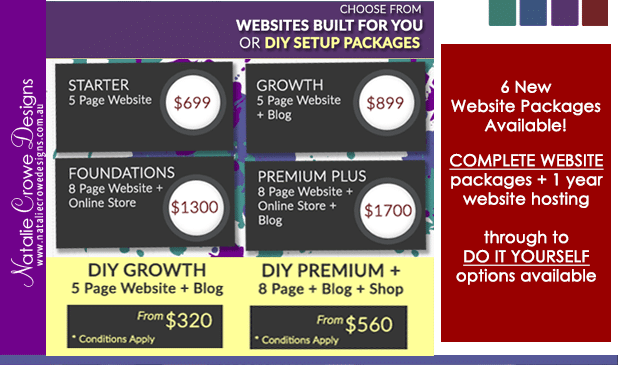 Our 2 “DIY” Website packages; DIY GROWTH & DIY PREMIUM+ , do not include website hosting or domain, or custom designed content. We simply lay the foundations for you. Included in the service is the setup of the primary functionality of either the GROWTH (Website + Blog) and PREMIUM+ (Website + Blog and Store) packages. The peace of mind knowing your website is properly installed and configured version of WordPress, with the primary functionality, plugins and more configured and ready to go for you to design and add your content as desired, is one of the main benefits of these two DIY packages. Wix is a great starting platform for any business. However WordPress offers a better a long term solution for business owners wanting to grow and improve their presence online. 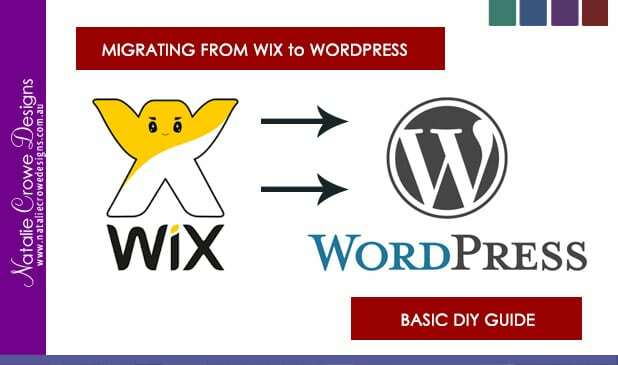 In order to migrate from WIX to new WordPress setup you’re going to need to do some ground work to prepare yourself. There isn’t an actual conversion tool that does this migration for you cost effectively. Most often it’s like going to be a case of recreating the foundations in WordPress and whole lot of copy and pasting. Whilst you’re rebuilding your site you’re going to want to have a domain name or website address to build your website with. Domain names are cheap in the grand scheme of things, you can pick up a basic domain for under $25 a year. Once your site is developed and you’re ready to go live, you can move your actual business website address over to the new platform. – I emphasise here you’re not going to lose it . We just need to get the process started so you can start building and the most efficient way to do that is to just purchase another domain name. Second to your development domain name, we’re going to need to setup website hosting. Your website hosting is a purchased online storage space for the files and resources related to your new website. With your WIX website the hosting was included in the free or purchased account you had there. 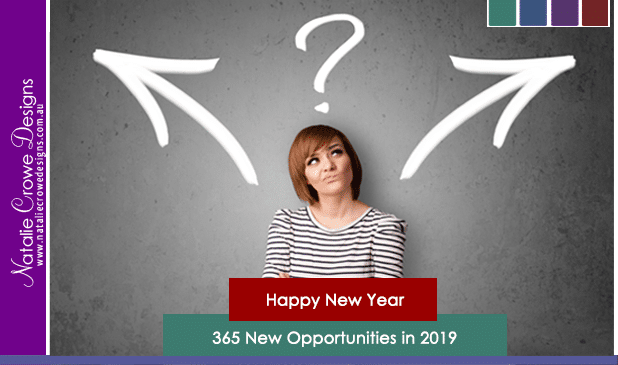 What hosting package will you choose? Which domain and hosting provider will you choose? Many of our clients have SITEGROUND.com accounts setup. Siteground is a domain and hosting service you can buy products through. 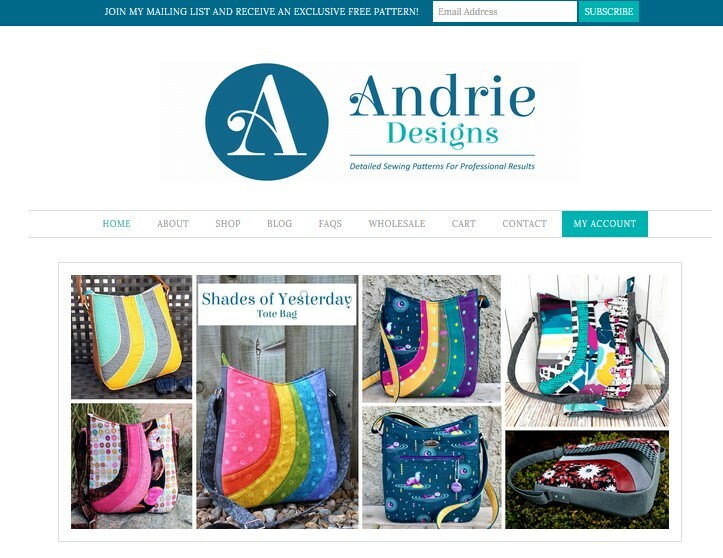 For this walk through I am going to use my links for specific siteground products however you’re free to choose whichever platforms you feel comfortable using. Go to https://www.siteground.com/go/ncddomains and type in the domain name you’d like to purchase for the development. You’ll see a heap of different options and prices so pick and choose which one will be the best for you and then click “add to cart”. 2) Next we’ll choose a hosting package. If you click on the direct link is here: https://www.siteground.com/go/ncdhosting it’ll load recommended WordPress hosting packages. You can then click Add to Cart on the relevant package you’d like to purchase. 3) Lastly for this component, we’ll process the cart and configure your account. Follow the prompts to complete your purchase. You’ll likely get an email in regards to your new account and how to login to your control panel to manage your new SITEGROUND account. Login to your new hosting environment. If you’re using SITEGROUND there is a free installer for wordpress, however if you’ve used another hosting platform you’ll need to locate the installer inside your hosting control panel. Once you’ve found the installer. Install WordPress on the ROOT level directly so just on “/” not in a folder. We don’t want to make our links any longer. You can pick whatever theme you want – if it gives you the option to choose a theme here, as we can always change the theme later on. Once installed – You can configure the overall wordpress installation. 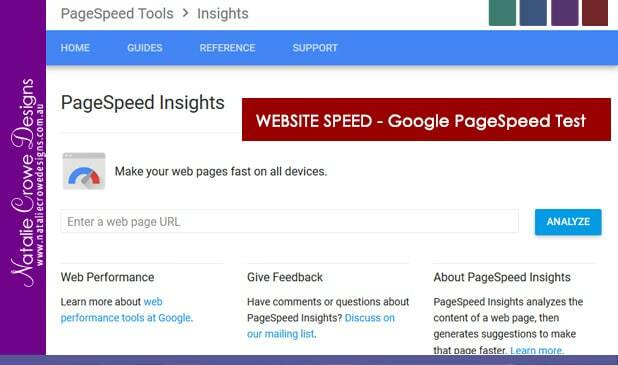 Go to SETTINGS > Reading and tick the ” Discourage search engines from indexing this site” so that your development site doesn’t come up on the search engines straight away. We’ll untick this when we go live. 6) Next you’ll choose and configure a theme. Go to APPEARANCE > Themes and explore the range of “free” themes from the theme options, or you can purchase / install other things from external locations. You can configure the theme as you like. Initially these will just be the place holders you’ll populate the content later. Go to Pages> Add New Page and add the name of the page and leave it empty pages. Click Publish. Go to the “Add New” button now located at the top of the page or go back to the side menu and click Add New under pages and repeat the process for each of your page. 7.1) Tell wordpress which is the homepage and which is your blog page. Go to SETTINGS > Reading and select “the homepage displays as STATIC” set the Homepage to you new homepage and the posts page to your blog page. 8) Create the primary menu – now you’ve created the basic pages we’ll construct a menu. Tick the page names on the left and add them to your menu. Tick the “Primary Menu” box often found on the bottom righthand side. of the screen – to tel the theme to use this menu as the primary menu. ♦ Updraft to enable to you to make backups off the site. ♦ Yoast plugin for optimisation . ♦ WP Maintenance Mode – Creates Maintenance Mode page so the public can’t see your development. Depending on the plugins you’ve chosen to install there is often some sort of configuration for each of the plugins required. Configure these the best you can and then we move onto migrating the content. 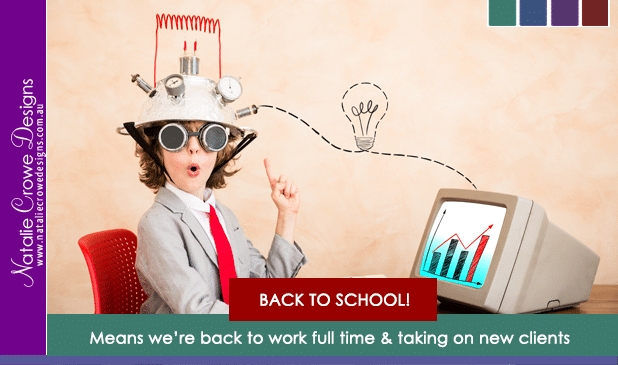 Work your way through each page copying and pasting the content from your old site to the new site. To do this go to Pages > Open the page you’re working on. You’ll need to copy over the content from WIX. I’d suggest going through and saving copies of your images to directly from your WIX site and re-uploading them to your new site. To add photos to your page you’ll need to go to the “Add Media” button and upload files . If you have blog posts, you’ll need to complete this process for those posts on separate blog posts. There are plenty of other things you could do with your website configuration but this should give you a solid foundation moving forward. Login to the WIX website. Go to the “My Domains” page. Note: If you have more than one domain in your account, select the relevant domain. Click Transfer away from Wix. This will trigger an EPP code which you’ll use to transfer your domain name over to another domain provider. Best of luck and we’ll post further instructions and step by step resources moving forward. and self employed business owner for almost a decade. My next Blog Post feature client is one of those amazing clients I work with remotely, who is not only an amazing client but after spending volumes of time together over the years – I am proud to call my client and friend. 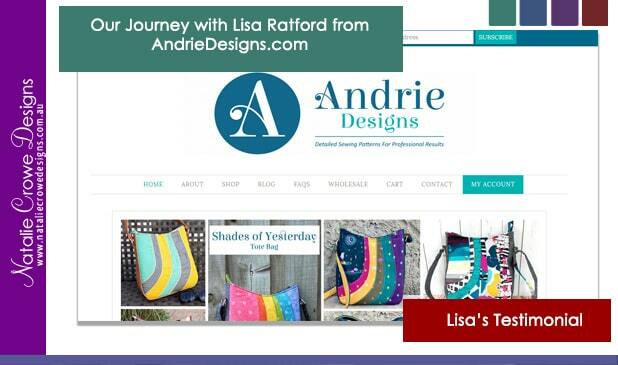 Lisa Ratford – The owner of AndrieDesigns.com formerly TwoPrettyPoppets.com – an indie pattern designer specialising detailed sewing patterns for professional results, contacted me in regards to getting some business mentoring and website support some time ago. 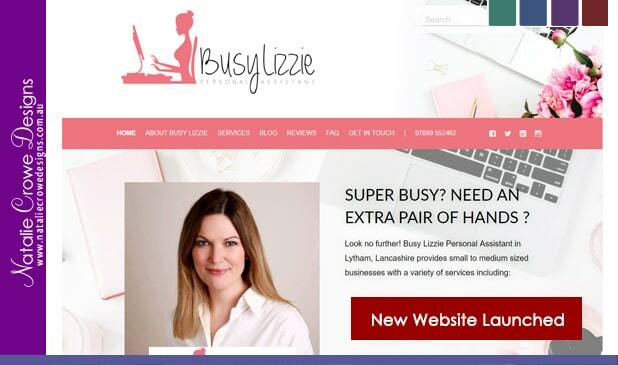 We’d worked together on “tweaking” elements of her website and growing her online presence, eventually moving Lisa over to our hosting platforms and redesigning her website to suit her ongoing demand and new face of her business. When I spoke with Lisa about the possibility of her being willing to prepare a testimonial for me, she was more than obliging and call me a sucker for happy ending but her words brought me to tears. Lisa and I have been through so much over the years with troublesome/ dud development, technical challenges and who can forget the “Double” Move – shifting from one hosting company – and being the only account on the system to have issues, to then completely pick up that site development not a month later and move the site again – as a means of allowing Lisa’s website to function at it’s best. 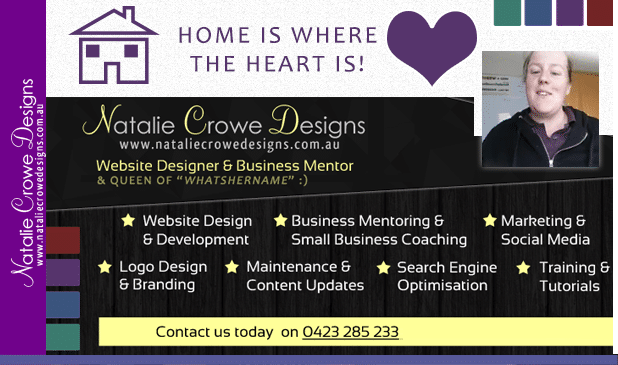 “When Nat first asked if I’d be able to write a testimonial for her revamped website, I didn’t give it a second thought. After the complete and utter chaos my poor website has been through over the past few months, it was the least I could do to say thank you! Natalie Crowe Designs has been working with local Genealogical Society ” Maitland & District Genealogical Society Inc” MDGS for short… to develop a new website to share the services and provide the public with a means to make enquiries about the historic information stored within the various resources the Society has. 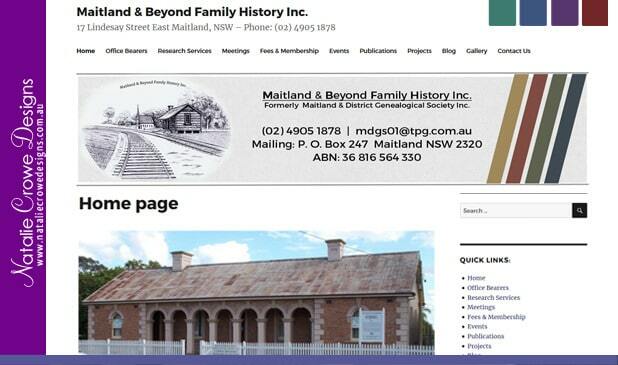 MDGS underwent a name change and is now known as Maitland & Beyond Family History Inc. in 2016 and the new website reflects this change. The original development was close to $3000 worth, with a great deal of time and planning as to what was needed long-term for the Society. 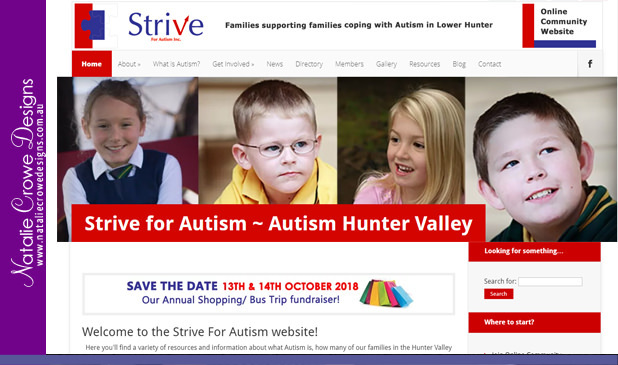 Things like; Where the site would be going in the years that followed the development of the website and the simplicity needed so that members of the Society could self manage and update their new website. I met with several members of the society at the Barracks at 17 Lindesay Street, East Maitland to discuss the website development needs and what would be best suited for the growing society – long term. After the consult, I spent time going over what was currently available in way of an online presence and what other services were offering. Whilst there were very little in the way of offerings locally, I felt a strong connection with the Society and what the Society had to offer. I felt that the Society provided the local community with many an amazing resources, not only connecting the past with the present and helping people connect the dots but the many uncovered gems here, the preservation of our history and what we’d provide for future generations. My primary aim, whilst being in business, was to support and nurture… with the conscious intent of ensuring this type of resource was available for years to come. Whilst I often donate time and funds to community services like this. 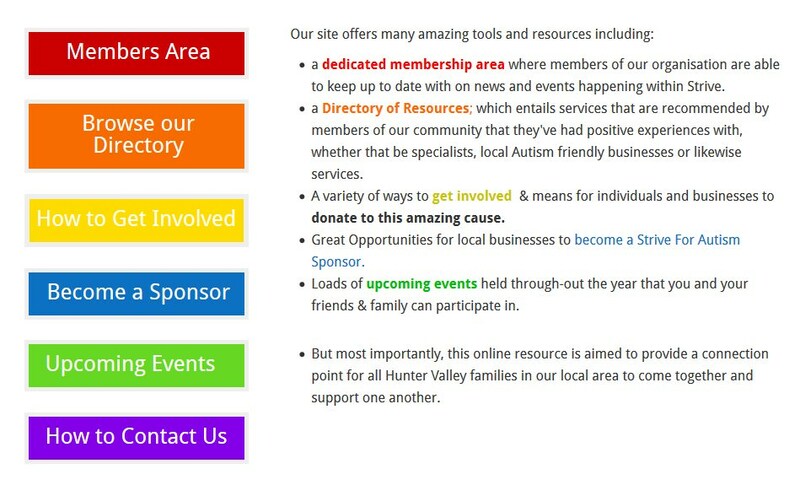 I wanted to include at least a $600 discount from my current years “donation budget” as a way to give back, by the time I’d finished the proposal – from memory think we reached a collective to $870 worth of time donate to the Society free of charge as a means of supporting the amazing efforts of the volunteers at this not for profit service. Maitland & District Genealogical Society Inc (MDGS) was originally formed in 1998 as the Maitland Family History Circle Inc. 12 years later the name was changed; and following many years operating from the Community Room at Maitland Library on Wednesday mornings, MDGS moved to its current location at the Mounted Police Barracks, 17 Lindesay Street, East Maitland in 2011. In 2016 MDGS became Maitland & Beyond Family History Inc. While we are located in Maitland, our research is not restricted to Maitland alone. We can help you with your ancestors whether they lived locally or beyond; came free or convict; English, Scottish, Irish! 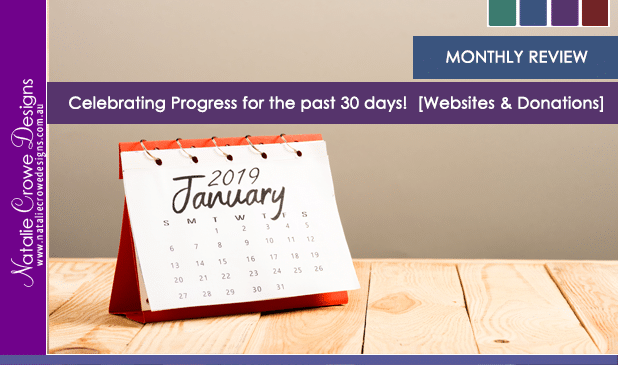 The 31st of July and I’ve realised just recently that I’ve been so busy working on my amazing client’s websites and mentoring, that I’ve not made time to blog on my own website!! It’s been a busy 7… going 8 months and I have been reflecting on this time. As many of you may be aware, we bought our own home in the Hunter Valley at the end of 2016. We had been renovating ahead of moving in, which took us several months. We finally took the leap and started the adventure in Abermain on the 1st of May. Now who would have thought being a home owner could be so diverse.. in-between settling in, unpacking, re-arranging and being able to put a hole in the wall to hang a picture… tending the grounds… “decorating” and really establishing solid roots in our forever home…. it’s been an eye opening experience… something I’ve literally spent more than a decade trying to achieve…. and we did it… we are finally homeowners… a part of the hunter valley community and genuinely ready to lay down solid foundations for the future here. 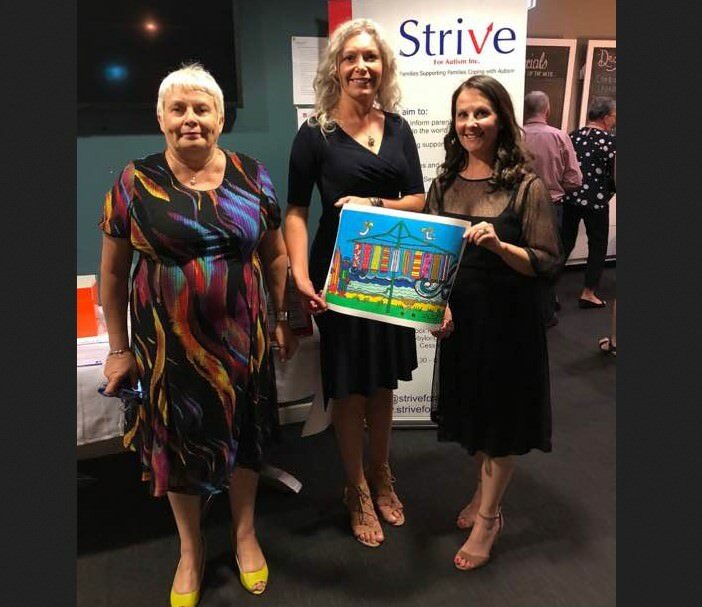 From humble beginnings – just wanting to make ends meet – put a roof over our heads and keep food on the table – as a single mum with limited work prospects – time and means of doing a regular 9 to 5 job… To now wanting to build an empire.. a community and mould this idea I have around supporting business owners in the local community and online. I too, have taken too being more accountable, more visible… I’ve entered the world of Facebook Live afew weeks ago, jumping right in and putting those stereotypes to rest that you need to be pristine and perfect to be in front of your audience… I’m generally not either of those things but I am damn good at what I do and my client’s don’t care about those things, they care that they are looked after – catered for and that when they need my knowledge and expertise I deliver. 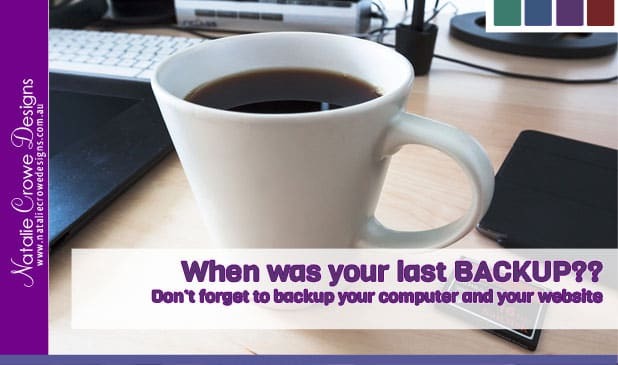 WHEN WAS YOUR LAST BACKUP?? It can be your worst nightmare when you have a system go down; such as a core system for your business, your email or your actual website, there may have been a problem with a component or perhaps you were a target of a cyber attack – and had your website hacked. These are frequent occurrences we often see our new clients come in with. And as a result, We’ve helped numerous clients reinstate their existing system or rebuild after their devastating losses. In some cases, there may not have ever been a backup made, which requires further investigation and possibly having to rebuild your system from scratch. 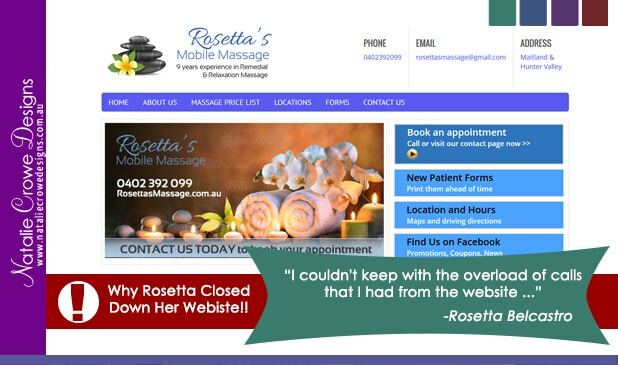 With clients describing it as a ‘heart breaking’ process after building there website or system up over years. And then going through the process of knowing that this whole ordeal can be made exceptionally more efficient and can save a whole lot of heartache by simply making sure you’ve got a backup to work with. —> WHEN WAS YOUR LAST BACKUP? —> Have you backed up your actual computer with all of your important files? —> and have you added “backup” dates to your calendar?? Depending on your systems as to what type of backup is needed, There are plenty of tools available for you to efficiently make a backup copy of your system and provide you with peace of mind. One other tip- STORE EXTERNAL!!! If you’re backing up your computer, don’t store the backup copy on the computer – pick up an PORTABLE HARD DRIVE from Officeworks or Big W and store your files there… if your computer hard drive crashes you have the PORTABLE HARD DRIVE as an alternative. If you’re backing up your website, download a copy to your computer or store on another location outside your website hosting. Don’t fall victim to something you can actively take action against. If you’re not backing your systems up and need a hand please feel free to message our page. We will happily help get you underway.